Bring your own planters and learn how to create beautiful combinations that will suit your style. With knowledgeable staff and over 2000 varieties of container plants, your containers will never look better. These courses are offered at convenient times through the month of April, and last approximately 3 hours. Bring your own containers, hanging baskets or window boxes or buy one from our large selection. The fee is $5.00 per person plus the cost of the soil and the plant material. For the first time participant, bring two containers at least 14 inch in diameter, empty of old soil and with good drainage holes. Dress in layers and wear comfortable footwear. To register call us on 403-933-4814. The 2019 season will begin on Monday, April 29. Our staff will be pleased to help you make your spring selections and make suggestions on any summer planting that you might need. Hours of business for the month of May are 9 a.m. to 8 p.m. Monday to Saturday, and 10 a.m. to 7 p.m. on Sundays. If you don't have time to take a course but still want the professional look, bring your containers and let our designer do the work for you. Carefully chosen plants will make your containers look stunning all summer long. Custom Planting Week runs from Friday, May 10 to Sunday, May 19, 2019, 9.00 a.m. to 5 p.m. The fee is $5.00 per container plus the cost of soil and plant material. No reservations required. Our garden is beautiful in the summer. Come out for a drive in the country and be surprised at what you will find. Not only will you be amazed by the perennial display gardens, the alpine garden and the pond area, but also how much top quality plant material we have for sale all summer long. If you just need fill an empty space, or you are creating a whole new garden, come for a drive and you will love what you find. 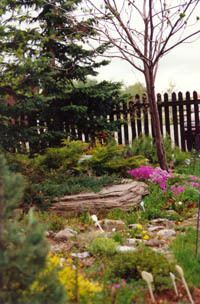 The perennial garden is open every Saturday from 9 a.m. to 5.p.m. In the History of gardening in the 20th century the name most often cited is that of Gertrude Jekyll. Probably, we all know that she was one of the foremost gardeners of her time, but she was a skilled, trained artist, and channelled her love of colour into wonderful works of art. Miss Jekyll was not the first and will not be the last to arrive in the garden to let that garden tell its story onto the canvas. It is from this inspiration that Vale’s Greenhouse proudly presents “Cultivation of Art”. 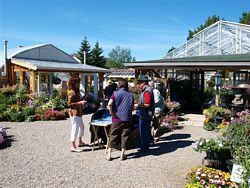 Vale’s Greenhouse has teamed up with 40 local Alberta Artists. Every artist is looking for a place to display his or her work; Vale’s Greenhouse is always on the hunt for an interesting project. Containers do not have to look drab all winter. There are plenty of exciting plants that will enhance the winterscape. 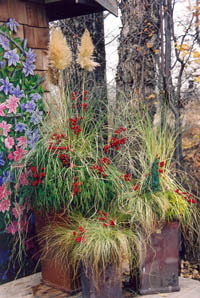 By using grass, evergreen and faux berries, your planter will look stunning for 6 months. 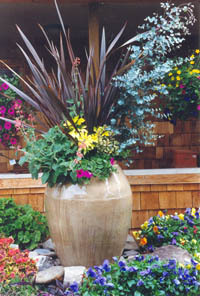 Amazingly a winter planter that does not need water or fertilizer. Take the next step in gardening. Register early by phone 403-933-4814, as space is limited. Course date is Saturday, September 29th from 1 pm to 4 pm, and September 30 from 1 pm - 4 pm. Our gift shop is ready for the Christmas season by early August. Stop in and see what different things we carry for the gardener in your family. A large selection of household items as well as outdoor items will please anybody on your list. Phone for gift shop hours 403-933-4814.